What, our hay fields have been invaded! An army like no other! 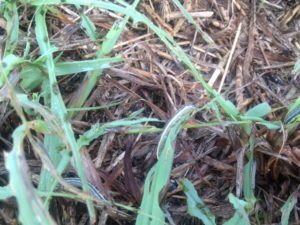 Yes, the dreaded ARMYWORM, the Fall Armyworm to be exact. How did this happen? The fall armyworm cannot survive our cold winters???? 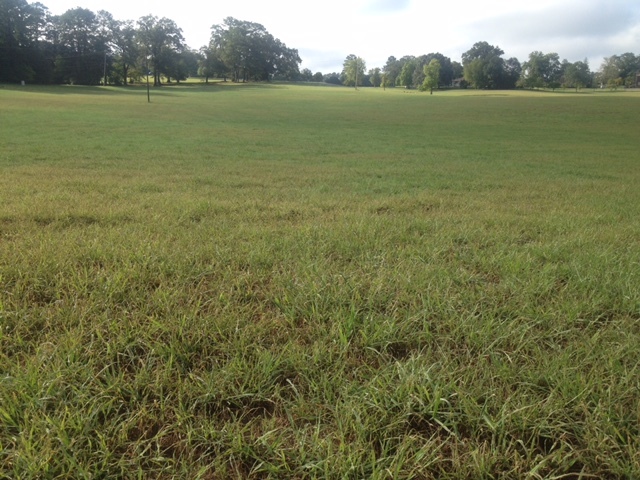 It turns out, a lovely gray moth from the south floated north on the summer breeze, and found a tree next to a wonderful hayfield or pasture here in Georgia to lay her eggs. Then, without warning, August 16th, 2016, three weeks later, our hayfields have HUGE brown spots in them. Notice the tiny caterpillars. So many in a small area. 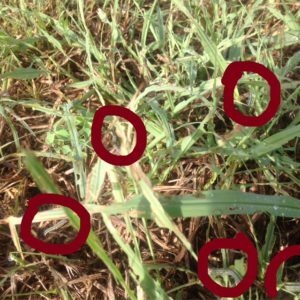 Why do we have these brown spots in our tender, healthy hay fields? Because of thousands of hungry caterpillar that have hatched from that moth’s eggs. The small caterpillars were hiding undetected for weeks. Now, as the adult caterpillar is coming close to its pupa stage, it’s consuming more foliage than it has in the past two and a half weeks of life altogether. Yes, their name is the Fall Armyworm! This is not the first time we have been invaded by this destructive insect. Several years back, we had a terrible drought. The grass was low to the ground but still green. Then a small circle of bare dirt showed up. By nightfall, an acre turned to bare dirt. We went to investigate and it was the fall armyworm. It got so bad that year, as the cattle walked across the fields, dust boiled up behind them. The fall armyworm came out of the pastures and attacked our yard. There were THOUSANDS of fall armyworms crawling across our concrete. You could not take a step without crushing a dozen of the growing caterpillars. The grass looked as if it was blowing in the wind, but the air was still. It was just the caterpillars crawling to the top of the blade of grass and falling down. It was so bad, you could hear them munching and crawling! This devastation was a result from the decision we made not to use pesticides. 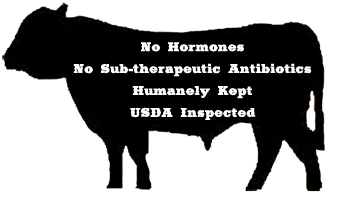 We are committed to producing a clean grass-fed beef product. Last year, they attacked as well. This time the army worms were eating on our hay fields. We noticed them at the early caterpillar stage. Instead of using pesticides on the hay that was to feed our cattle, we decided to cut the grass for hay as soon as we saw them. This worked well. They were crawling out of the hay bales for a few days, but most died in the process of cutting. However, on fields that were cut for hay customers, the customer requested we spray with pesticides. This worked well for those fields. This year is TRICKY! We have them in two spots. One hatch is on a hay field designated for a hay customer, and another spot is a hay field cut for our cattle’s consumption. The hay field for our customer is an easy decision; they have instructed us to use pesticides. But, we are in a pinch! The USDA has declared our area, Gordon County, as a class 4 drought. We are feeling the effects of this year’s drought. We have most of our hay needs put up this year. However, we are already feeding hay to some of our herds that are low on grass. We don’t want to see the bad side effects from the years past. The hay fields are not tall enough to cut like we did last year. Also, other invasions have been in late summer. This year, they have hit earlier. From what I have read, a hatch can occur every 30 days or so. 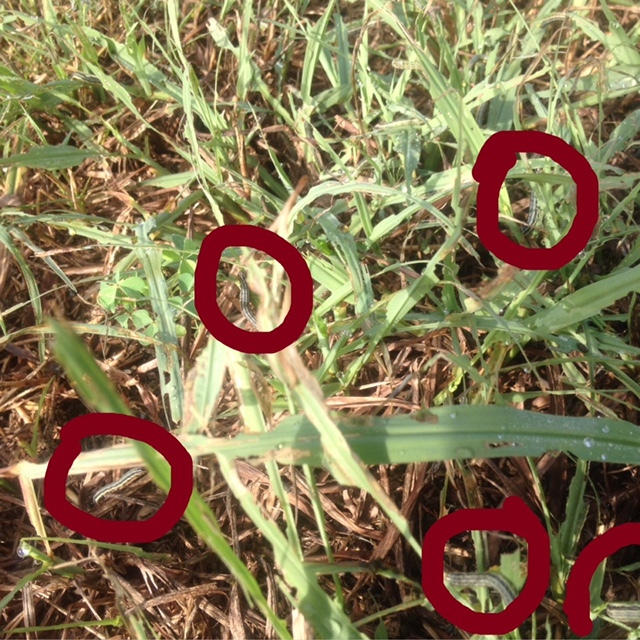 If we do not get a cold snap to kill these pests, then we could see the second generation of armyworms. So we have a hard decision to make. We have turned to God and prayed about the steps to take to protect our hay fields and pastures from these invaders. Right now, we are watching, assessing, and keeping faith!